One of the most exciting things I did while I was in London in September was go to the theatre. I got to see Les Miserables for the first time after listening to the soundtrack many, many times. I thought I’d do a theatre review and share the experience! And, because this is me, make some comparisons to Phantom too–another theatre review that’s coming soon! Spoiler warning for Les Mis (mostly who dies), as it’s hard to discuss without spoilers…but I’m guessing most people have some knowledge anyway. 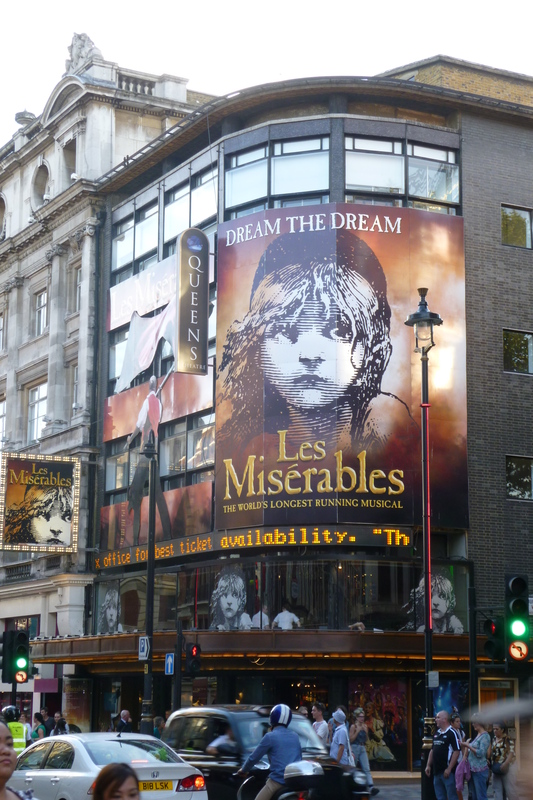 Les Mis in London is playing at the Queen’s Theatre, near Leceister Square. I set off there in the late afternoon, because I have theatre paranoia. I always have this dreadful fear that I’m going to be late to a play–fueled, I think, by the fact that some theatres won’t let you in for entire acts if the curtain is already up, and because I’m frequently seeing plays while traveling, and if I don’t see it then…I won’t see it. So I got there early, and ended up having a quick, order-at-the-counter dinner, at a place directly across the street from the theatre. And then of course I got there almost an hour early anyway! 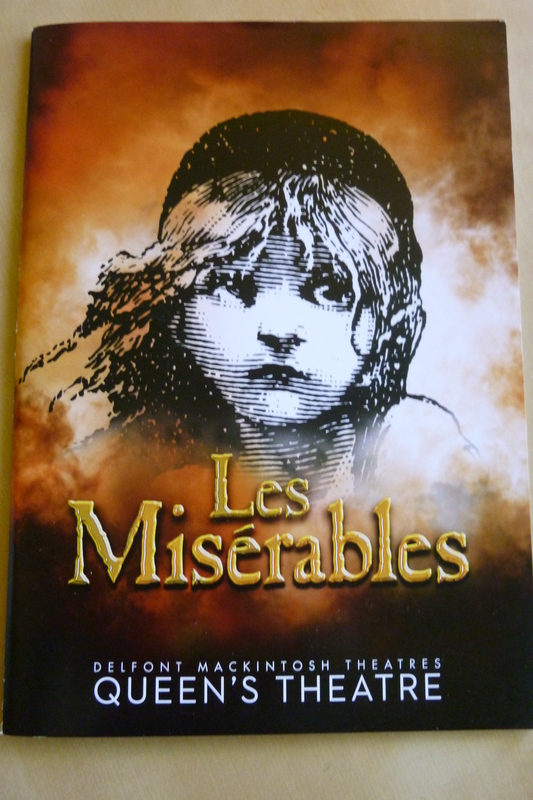 I bought my ticket for Les Mis last May, so I was able to get a really good seat–front row and center. I decided to splurge a little, since I’d never seen the play. And once you decide you’re buying a ticket, the nice seats are not really that much higher than the so-so seats. I think almost any seat in the house would be good, though, as the theatre just isn’t that big. The very short reaction–it was amazing. There’s so much more than is on the soundtrack. You can get most of Phantom on the soundtrack, but there are huge pieces of Les Mis that aren’t on the CD. They put all the dramatic songs on, of course, but there’s so much more dialogue, and scenes that reveal character or explain plot points. There were some bits that never made sense to me–and they do now! The plot is complex, but basically we’re following Jean Valjean, a former convict (for stealing a loaf of bread) who broke parole to try to remake his life, but is still being sought by Inspector Javert. Valjean’s path intersects with Fantine, a woman who’s driven to prostitution in order to provide for her daughter. Valjean ends up raising Fantine’s daughter, Cosette–whose path in turn intersects with Marius, a student who is in with a group of young revolutionaries, determined to rise up on behalf of the poor and downtrodden of France. That’s as brief as I can make it, and doesn’t even mention my favorite characters–who I’ll get to in a bit. Valjean and Javert were both excellent. They have such powerful songs, and are such complex characters. As I was leaving the play, I heard someone say, “I really like that even the villain isn’t really a villain.” It’s possible he meant Thenardier, the comic relief villain, but I think it’s more likely he meant Javert. And it’s true–Javert wants to hunt down Valjean, who the audience can see is unequivocably a good man, yet Javert is coming from a place where he’s convinced that he’s the one in the right. There’s a very nice handling of religion in the play, because both men are motivated by a belief that they’re doing what God would want of them. Perhaps part of Javert’s trouble is that he’s sure he’s right, while Valjean realizes it’s a struggle. Anyway, they both performed wonderful songs that blew me away. Geronimo Rauch (Valjean) has also played Jesus in Jesus Christ Superstar, and I could hear it a bit. I’m guessing he did an amazing “Gethsemane.” It’s that kind of powerful drama. The Queen’s Theatre – you can kind of guess what’s playing. After the major characters, I should talk about my favorite. I love Eponine. She’s a girl from the streets who loves Marius, but he just never sees her. In the production I saw, Eponine was played by Danielle Hope, who’s exciting by association; she played Dorothy to Crawford’s Wizard of Oz. I thought she was excellent as Eponine–emotional, heartfelt, so powerful in her major song, “On My Own” (which you can find on YouTube, by the way…though of course it was better live). You don’t get a lot of context on Eponine just listening to the soundtrack, so seeing the play, I realized she is so much braver and more complicated than I knew. It’s not just that Marius is oblivious, it’s also that he’s a higher social class, making her unrequited love even more poignant. Especially since he’s so oblivious, he wants Eponine to help him woo Cosette–which she does, at considerable sacrifice. Loved, loved Eponine. Fantine was very good too, with this wonderful personal quality to her “I Dreamed a Dream.” She seemed to be appealing directly to the listener; Eponine had a bit of that too. I saw Sierra Boggess as Fantine, which was interesting because she’s Christine in the filmed, 25th anniversary production of Phantom. The Thenardiers are much funnier in the play than on the soundtrack. They’re also more awful, so that’s a nice mix there. I was surprisingly impressed by young Cosette. I’ve never been that fond of her song, “Castle on a Cloud,” but it becomes more remarkable when you can see how small the girl singing it is! I wasn’t all that impressed by grown-up Cosette. It wasn’t the actress’ fault. It’s just that they give Cosette SO little to do. Which brings me around to Marius. He’s on stage more than Cosette, and is sort of more involved…but he is such a passive character. I didn’t think of this until I saw the play, but he reminds me a lot of Raoul from Phantom. Some of that may have been casting–he looked like Raouls I’ve seen–but I also think they’re the same archetype. They’re the very innocent, pure, utterly non-threatening romantic lead, uncomplicated and ultimately shallow as characters. And they can end up coming across as rather dull wimps. To give fair due, at least Raoul tried to rescue Christine. He failed, but he tried. Marius accomplishes nothing, and attempts nothing. He needs Eponine to find Cosette for him, and to deliver his letters to her. He fights on the barricade with the revolutionaries, but that feels like he’s just being carried along by his friends–and then he’s literally carried away from the barricade by Valjean. Marius actually does…well, nothing. Interestingly, there’s no romantic alternative for Cosette. Often the innocent romantic lead is paired with a darker, more complex and seductive figure (that would be the Phantom). Les Mis, on the other hand, gives Marius a romantic alternative in the darker, more complex Eponine. She’s had a harder life than Cosette (after age five or so), she’s smarter and more capable, and she’s not as innocent. She’s also the socially-challenging choice. That in turn makes me question Marius’ revolutionary fervor. The revolutionaries are all about equality and raising up the lower class, yet when Marius falls in love, it’s with someone from his class (or who at least appears that way). He barely seems to realize ragged Eponine is a girl, but he falls madly in love with prim and proper Cosette, literally at a glance. Marius may come across better in the book, but I was not impressed by him in the play. I did believe in the revolutionary fervor of the others, especially the leader, Enjolras. He was my favorite of the students. And I loved Gavroche, the little boy from the streets with an eye on everything. He’s so sweet and so clever. After the barricade is taken, there’s this moment where they turn it around and you can see the front. Gavroche is lying dead among the soldiers, and Enjolras is spread out hanging off the wall with his flag…SO SAD! I was also (differently) sad that Gavroche didn’t get to sing “Little People.” He reprised it a couple of times with a verse or two, but he never sang the full song from the soundtrack. I’m sure that made the reprises less moving. Anybody know if that’s normal, to leave out that song? Javert’s death was a little oddly handled. He’s supposed to be jumping off a bridge into the Seine, but instead of having him literally fall, they raised the bridge behind him. And…it looked like a bridge rising, not a person falling. I would say that’s fine, maybe you can’t have someone jump down into water on stage–but Raoul does it, so I know it’s possible. Although Raoul wasn’t singing at the time. It was such a good night at the theatre. Now I can’t wait for the movie version. And on one last happy note, after the last bow, there was a cast group hug. Valjean grabbed Madame Thenardier in a bearhug, and then everyone piled in. So cute! I have seen the musical but have not read the book which I planned many times before. I listen to the soundtrack often and enjoy. What’s remaining is to see the recent movie. Thank you for the nice summary. but I like this audio a little better http://jeanvaljeans.tumblr.com/post/26501602091. He does crazy things with his voice, woah. He also does a great “‘Til I Hear You Sing.” And he just seems like a nice guy. Poor Marius! Marius is a complete dork and all through the book I got this feeling like I should find him completely annoying but I just can’t because he’s so hopelessly adorably dorky. Haha, I don’t know if you want me to expound upon his backstory in the book, but yeah a lot of his and Cosette’s parts are not really examined in the musical, while Éponine was actually given a larger part and definitely “prettied up” a bit (she’s uh… a little bit crazy). I promise, Marius and Cosette are the cutest durn things. In the book, Marius actually isn’t really in with the revolutionaries at all, and he’s not at the barricades to fight for the cause, really. But Marius’s “Empty Chairs at Empty Tables” is so haunting. Check out the Tenth Anniversary Concert and watch the Ball do it. Boss. You’d love Gavroche in the book, then, if you love him here. He’s even more sweet and clever. As for Javert’s death, I wonder if they wanted to make it a little more dramatic with a more slow-motion, controlled fall. He could fall like Raoul, but that is really a quick thing. Something I hate about all of the Les Mis movies I’ve seen is the way they handle Javert’s death… for me, it’s too quick. The musical has done it best of the adaptations I’ve seen. In the 25th production, Javert actually sort of… flies… while the bridge is lifted around him. It’s probably a little better effect, but it still didn’t make me feel like he was falling. But I like that they go for a more dramatic slower fall so that you can really just have time to feel it. Javert’s my favorite, so, ah, I have a lot of feelings, hahaha. The ending always makes me feel so happy and so sad simultaneously. It’s crazy how uplifting it is when yeah… everyone died. One more thing I forgot to mention! There are many Les Mis soundtracks available — I’m guessing you have the original London cast album, since (I’m pretty sure) that’s the only one with the full “Little People” on it aside from the Complete Symphonic Recording. Since the show is sung all the way through, they all just have selections, the most important parts, not the entire thing. The only exception is the CSR, the only complete English-language recording, but that one tends to be derided by fans for not having a very good cast. Actually, I was mistaken there — the London recording is the only one with the full “Little People”, period. Even the CSR doesn’t have it. Like I said, it was cut really fast! There have been a bunch of cuts made to the musical over the years, I believe to get it under 3 hours so that they don’t have to pay the actors overtime if it runs a little long. I don’t think the full “Little People” was in the show for very long at all before they started trimming it. What interests me most about the movie is that they’re making a lot of changes to bring it closer to the book, which will be fun for me because I’m a huge book fan. HAHAHA that’s Marius in a nutshell yes. I’m so interested in all of the book things that seem to be being added into the film as well; I love the book even more than the musical. I want to see the movie, too! Anne Hathaway as Fantine, singing “I Dreamed a Dream” should be worth the ticket price alone. Then there’s Hugh Jackman, too . . . 🙂 But there’s no substitute for a live performance of such a dramatic story. Thanks for the review.